The Story: I've always been one to scoff at all these Birkie and Scholl rip-offs. What's with all these shoo stores copying their trademark looks? 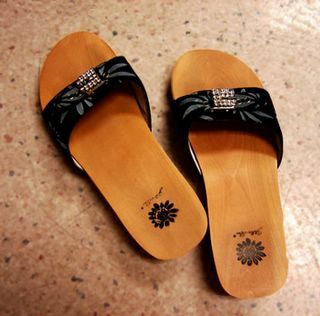 I would say, "This is about the comfort and make of the shoo, not the fa-shun! Duh!" But I have been made to eat my words when I saw these bling-bling Scholl wannabes at Novo. So preeetteeee! They came in a few colours - baby blue, black and red. And I'm never one to ignore bling, especially when it's on a buckle. I should pause and now gush about Novo. Never have I walked in and bought 3 pairs of shoos at one go. Maybe two pairs from two different stores, but never have I found so many pairs that I could like and afford to buy at the same time in the same store. It was my mother who had wandered into the store looking for a comfy pair of shoos while she was waiting for me to manage a feminine emergency (is this too much information?). When I got back, I joined her and immediately forgot all about my cramps. The pain now was on deciding which pair to try on first, and then which to buy. Of course it helped that they were clearing their stock and offering 50% discount on a large section. Back to this shoo...I'm guessing it's not as orthopedically sound as my Scholls, as it doesn't have that little hump in the middle for the arch of the foot, nor does it have the little grooved bits for your toes, but nevertheless, I am still determined to find out if they have the ability to shape my calves with prolonged wear. We are awn for tonight and tomorrow night. I hope I don't fall on my face or look like a fool. It's Friday morning and I am loath to start work. So I did some surfing, and behold I found the funnest thing ever - StripGenerator. Hours of fun and so easy to use! Go make yours! 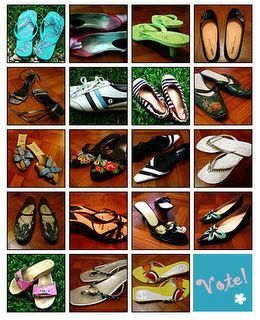 ShooPoll: Which is your favourite? We have reached the 20th shoo! Well, almost. I thought a little poll would be nice to see what you think. Nothing serious, but I'm curious to see what kind of shoos you like. All for fun! Click on the image above to view the entire set in glorious close-up. Let me know in the comments box below. Get to it, shoo! Today, I crossed that line into real adulthood. I can't fool anyone, much least myself anymore that I am still a little girl who's just playing at being grown-up. I guess it's hard, since I still live with my mother and she does the housework, pays the household bills, cooks and cleans, and oh, still nags me about coming home late on rare occasions. But since I've bought my new car, taken over my dad's club membership, and had my phone line transferred to my name, it's time for me to start paying some bills myself. Hence the need for a checking account. Having a cheque-book is that last step in attaining independence as an adult. I've held out long enough, happy to delude myself into thinking "I'm not an adult yet! Turning 21 (5 years ago) was just a number!" But oh no, it's time to grow up and move. So today, I opened a checking account, and I have a brand new cheque-book with empty pages to fill up. I am now filled with glee as I survey the clean pages, and imagine myself whipping out an adult-looking pen (say, Mont Blanc or Namiki) and signing my name with a flourish. Tralala. I realise that while I have spoken about where I stayed in Maui, what I ate while there, I never said a word about the place itself! Silly me! These photos should rectify that. 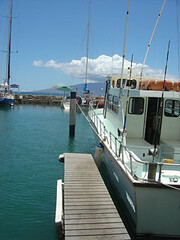 I spent most of my time in Lahaina Town, probably Maui's closest answer to its city. It's really small, and most of the activity centres around one street, Front Street, so named, I'm guessing because it fronts the ocean and the harbour. It has the small-town charm without being feeling like hicksville. Rows of shophouses line Front Street, and they were either art galleries, souvenir shops selling T-shirts and other little goodies, fashion shops, jewellery stores, or little tour operators promising exciting adventures in the sea, up a mountain or in the air. boats moored to little wooden jetties, mostly for tourists out looking for a pleasant cruise or offering fishing and whale-watching trips. 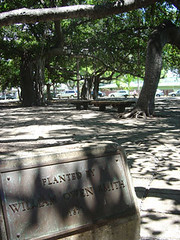 Behind the courthouse is a shady little square where the banyan tree sits. On my second day in Maui, I had some time to kill while waiting for my taxi to come pick me up to bring me back to the airport. So I had a double scoop of Haagen-Dazs ice-cream and sat on a bench under the banyan tree, enjoying the cool air, and had a pleasant chat with a local and another passenger from a cruise ship who had just arrived. At the airport, a last glimpse of Maui before heading inside to wait for my plane. 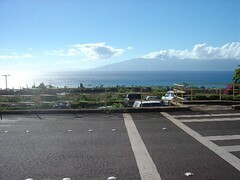 The view from the airport is wonderful, you get a wonderful view of the blue Pacific Ocean. I want to return to Maui again someday! 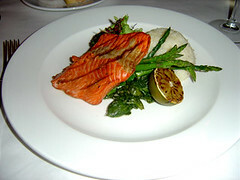 For my mains, I had a grilled salmon resting on a bed of asparagus and other veggies, with vanilla rice on the side. 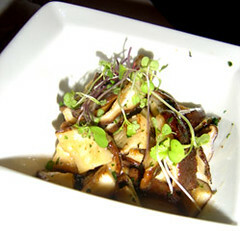 And of course I couldn't resist the shitake mushrooms as a side dish, especially when sauteed in butter! 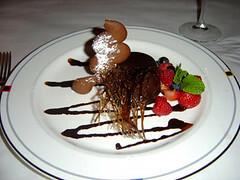 As a grand finale, I tried the chocolate mousse cake, with the delectable name of "The Road to Lahaina". It came with a base of macadamia nuts, in true Hawaiian style. 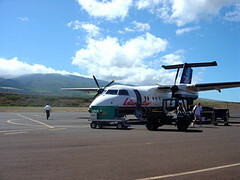 I landed in Maui at about 9.30am but my hotel couldn't check me in until 1pm. 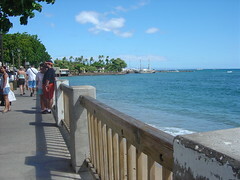 So I took to wandering around Lahaina town to explore and also have an early lunch. I finally stopped in a little cafe at what looked to be the town's shopping centre with one cinema, called The Wharf. Feeling completely in the mood, I ordered a rare alcoholic beverage to go with my grilled fish sandwich. 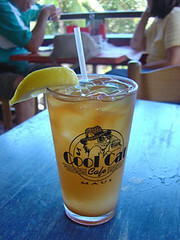 Mango rum with iced tea. Mmm. It was heady stuff, and it slowly went to my head, as I sipped it slowly and enjoyed the view, while an old Pacific Islander stood outside on a grass patch, intermmitedly playing incohereng songs on his guitar and preaching from a worn-looking bible. I was in a sleepy daze for the rest of the hot afternoon. I seem to be hit with an avalanche of spammers with the same lame-o "your blog is great, come visit mine!" comment. Arrrrgh! I spit on them, pui! Anyone know how to get rid of them pesky e-diots? 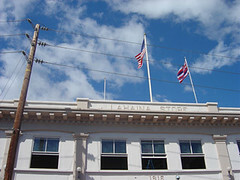 I decided to stay in Lahaina town itself, since it was pretty much Maui's town centre. I briefly flirted with staying at a beach resort, but after hearing from a friend that Lahaina was pretty, decided to spend my one night in Maui there. 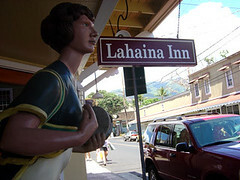 I found the Lahaina Inn online, while snatching little breaks in between work. I checked out user reviews at Trip Advisor and having found that most of the comments were really positive, made a reservation. On arriving, I found a tiny little boutique hotel with a very cosy reception area, manned by one friendly receptionist, who turned out to be the porter, concierge and everything else you can think of as well. The entire hotel is charmingly decorated in a very old style; I loved the flower wallpaper, old sepia portraits of long-gone people, the homey feel of the common room where there was free coffee, tea and a tin of Japanese sweeties out for everyone to help themselves too. The room also housed the only television in the hotel, but when you're on a beautiful tropical island like Maui, you don't need a television. My room was tiny, and there was barely enough room for me to drag my suitcase into the room to place on the luggage stand. 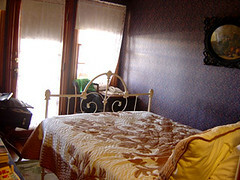 But it was very comfortable, with an antique-style bed, homey patchwork quilt, numerous cushions and pillows, old cupboards and my very own balconey with rocking chairs (of which I hardly made any use of). I wish I could have stayed more nights there. The Story: It was the end of my fantastic New York trip, and I had about 2 hours to wait for my flight to take me back home to Singapore. I passed by a store that had many many pairs of Havianas in cheery colours, like pink, yellow, lime green, white, blue...Having heard so much about these flip-flops and how they were, like, the most comfortable pair of flip-flops in the universe, I decided to buy one pair with my extra US dollars, and stashed my last buy in New York in my already bulging carry-on bag. 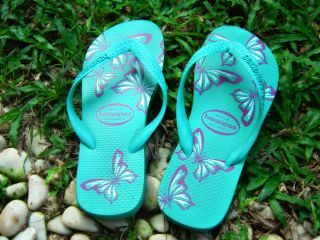 I am happy to report that Havaianas really do live up to their reputation. They are indeedy most comfortable and cushiony, of course I would dispute the "most comfortable evah" label. These flip-flops have served me well in the past year, travelling with me to my usual KL trips, my Korat mission trip, and most recently, to flip-flop city itself, Hawaii. What would I do without them? The flickr is alive, aliiiiiiive! Hurrah I now have a flickr account, thanks to the Cowboy's wise words! In the meantime, while I tinker around with it, click on the piccie on your right to get to my first batch of Maui photos! Waikiki beach in front of the Hilton Hawaiian Village. That's Diamond Head in the background in the picture on the right. I didn't have as much time as I would have liked on the beach, as most of the time, I was indoors working. The only free time I had was the day I arrived, a half day during the day after, and the early evenings from 5pm onwards. So in total I only managed to get two beach visits in. Not much for a week in Hawaii, but I took what I could get. Anyway, Waikiki beach is a very, very long stretch of not-so-white sand and a very gentle surf. The water there is warm and the currents are great for bobbing in the ocean and feeling the sun on your shoulders. No bodysurfing though. I saw some surfers go in and swim to the outer reaches to try and catch some waves. I considered taking some surfing lessons, but I figured I preferred to stay on the sand, and go for the occasional dip. I liked going to the beach there becuase I didn't have to feel too conscious about having my gut stick out, as everyone there seemed so comfortable in their skin and just let it all hang out. Why can't it be more like this in Singapore? 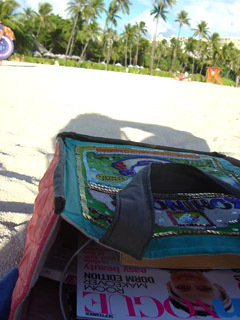 All it takes is lovely warm weather with a little breeze, the not-so-hot afternoon sun, a copy of a fashion magazine, an ipod with lots of rockin' tunes, a sarong, flip-flops, sunnies and a smokin' bikini, and I'm a happy camper. Note: There's so much going on this month that it requires two posts! You can see the older one here. ...trying not to speed while I break in the new car, french pedicures, Clairol Herbal Essence shower gel, Benefit Fantasy Mint Wash, my new bandeau style bikini from Billabong, fashion magazines (Teen Vogue, InStyle and a Japanese one I bought from the Narita airport), gaucho pants, turquoise shell necklaces, giant flower hair-clips, catching up on reading. How's August been for you? Aloha! It's been a great time in Hawaii, but haven't had much time to do Internetty stuff, what with work and the limited access to 'puters. The flight here was great. I flew Japan Airlines, and on the second leg of the journey, got upgraded to executive class, with nice big comfy seats and giant footrests. The foldout screens were very good too. Felt like real business traveller. During the stopover, I saw Anthony Bourdain striding away to his gate to catch his plane. I stopped and stared, but didn't have the guts to go over and say hi and ask for a picture. Also, he looked like he was in a rush. But squeeee! Anthony Bourdain! I love his books! 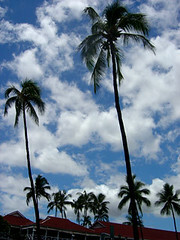 Hawaii is hot but nowhere near as humid as S'pore. The weather cools down a lot during the night and there's a nice breeze going. If S'pore were more like this, I would have far less complaints. 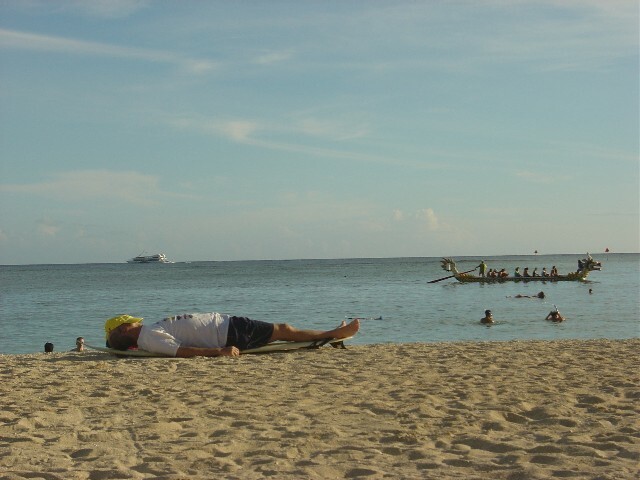 I've been to Honolulu before, so didn't bother with all the sightseeing things, so during my free time, I only did important things, like go to the beach at Waikiki, and go shopping. The Ala Moana mall is huge. I'm getting a real Gold Coast vibe in this place too. The casual beachy style, the flip-flops, the tanned and sunburnt lobster people....it's all the same. The number of Japanese people here is astounding! Walking down Waikiki could be like walking along a street in Japan. There are lots of little ramen places to eat (cheap and tasty too), and the big brand shops like Prada, LV, Gucci, Dior which they love to shop at. And I keep getting mistaken for a Japanese! 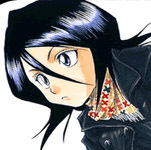 Must be my Kuchiki Rukia haircut...hehehe. Note: I know I'm kind of cheating here because I've already sort of featured this pair here when I first bought it, but what the heck, it's still part of my shoo collection, I forgot to charge my camera and I've been busy. The Story: I have two favourite sections at Tangs. The first is the beauty hall on the ground floor - I love to browse all the make-up colours, perfumes and various pretty pots at all the counters, and the second is the expensive section tucked away in a corner on the second level, where there are labels like Paul & Joe and Alannah Hill, and beautiful, beautiful shoos from Beverly Feldman, Ras and many, many more. Most times, I just look at them and mentally file them away into my imaginary wardrobe. 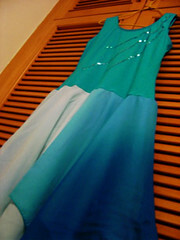 But sometimes, they go on SALE, and suddenly these lovely items are within my grasp! 50%, 70% off, excitingness! 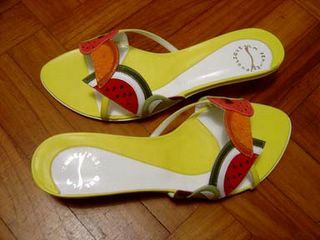 So yes, I picked up these very bright shoos during a big sale. And everytime I see them, I feel very sunny and happy, not only because I got them at a bargain, but also because it's the most colourful pair of shoos I own. It's all part of my plan to banish black from my wardrobe. Years ago, it was just black black black shoos because they went with everything, but really, life's just so much more fun with colour, no? 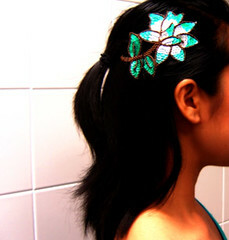 ...sandy beaches in Maui, Sephora, sparkly butterfly clips, my new ipod pouch (fluffy owl! ), dance practise, Pepper Lunch, America's Next Top Model, my new Kuchiki Rukia hairdo, Royce & Valhrona chocolates, ignoring the tummy monster, Aya Kato desktops. I'm leaving for Hawaii this Fri, and there's still a list of things that need to be done. People tend to roll their eyes and go "yah right" when I tell them I have to go there for work, but it's all troo, I tell ya! I'm not going there to enjoy pretty white beaches, palm trees, ok? I'm going there for real academic conference/exhibition hor. So yes, I'm very busy right now. This site will probably be dullsville for the next couple of days, but I might manage a ShooStories still. We'll see. Until then, in a while, crocodile.